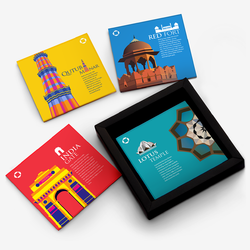 Prominent & Leading Manufacturer from New Delhi, we offer foam coaster set, leather coaster set, mdf coaster set, steel coaster set, printed stainless steel coaster and acrylic coaster set. 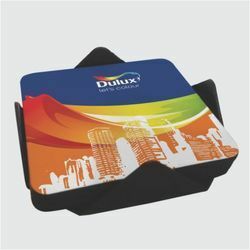 We have carved a niche as a leading manufacturer, exporter, wholesaler, trader, importer & supplier of Foam Coaster Set. This coaster set is highly used in bars, hotels and restaurants to cover the glass and as well place the cup or glass on top of them. 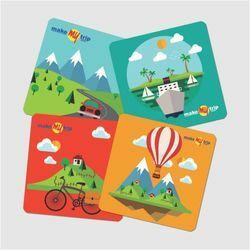 The offered coaster set is made accessible in various designs and sizes to suit demands of customers. Also, we are giving this coaster set to customers within a given time frame at reasonable price. 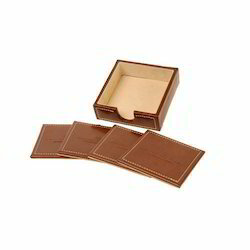 Backed by our rich industry experience, we are engaged in offering a quality assured range of Leather Coaster Set. This coaster set is designed as per the latest market trends by utilizing world class material under the guidance of skilled professionals. 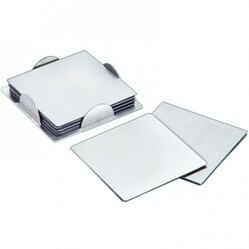 Offered coaster set is used to cover glasses filled with water or other beverages to prevent dirt or any other unwanted thing to get mixed in it. Our valuable customers can avail this coaster set from us in quality packing within confine time. We are counted amongst the foremost manufacturer, exporter, wholesaler, trader, importer & supplier of MDF Coaster Set. The offered coaster set looks highly attractive and used to keep on tables for placing various beverages upon it. The offered coaster set is provided in various designs, sizes & customized options to suit demands of customers. In addition, offered coaster set is checked by quality experts in order to ensure its defect free range. We are a most trusted name in between the topmost companies in this business, indulged in offering excellent quality range of Steel Coaster Set. Offered a wide range of Printed Stainless Steel Coasters. In conformation with set industrial norms. Manufactured under the strict eye of our extremely experienced professionals we deliver these products to the client after testing the product under different observations. We are one of the prime manufacturer, exporter, wholesaler, trader, importer & supplier of a broad collection of Acrylic Coaster Set. The offered coaster set is extremely demanded in homes, fast food restaurants, hotels and canteens for serving tea or coffee. This coaster set can be also customized by our professionals in various designs and sizes as per customer's choices. The offered coaster set is checked from our end before delivering to the customers. We are the prominent company for offering Plastic Coaster Set to the clients. Coaster Set is widely demanded among the customers. This product is available in various sizes and specifications as the requirements of the clients. Offered Coaster Set is extensively used and have some little dents on the surface.